The spacecraft weighs a ton and is about the size of a Mini Cooper car. It is designed to study Mars in more detail than ever before using 10 different science instruments. July 19, 2011, 3:08 p.m.
NASA has picked the final landing site for its next Red Planet rover after years of debate and will unveil its choice on Friday — nearly 35 years to the day after the space agency's storied Viking 1 probe touched down on Mars, agency officials said. The landing site will be the stomping grounds for NASA's latest Martian explorer, a car-size rover called Curiosity. Curiosity is the centerpiece of the $2.5 billion Mars Science Laboratory (MSL) mission, which is slated to launch in late November. Earlier this month, Curiosity rover scientists announced that they had narrowed the list of Mars landing site options from four choices to just two. Those potential landing sites are Gale crater and Eberswalde crater. Some scientists suspect that Eberswalde was once an ancient river delta, while the huge Gale crater has a mountain nearly 3 miles (5 kilometers) high rising from its center — which the Curiosity rover could try to partly climb, mission managers said. So which landing site is the winner: Gale or Eberswalde? NASA isn't saying yet, but the space agency will hold a press conference to announce its final choice on Friday at 10 a.m. EDT (1400 GMT). The announcement will be held at the Smithsonian's National Air and Space Museum in Washington on Mars Day, which comes just two days after the 35th anniversary of NASA's Viking 1 Mars landing on July 20, 1976. John Grant, geologist, National Air and Space Museum, Washington. Michael Meyer, Mars Exploration Program lead scientist, NASA Headquarters, Washington. John Grotzinger, Mars Science Laboratory project scientist, Jet Propulsion Laboratory, Pasadena, Calif. Dawn Sumner, geologist, UC Davis, Calif.
Michael Watkins, Mars Science Laboratory project engineer, JPL. 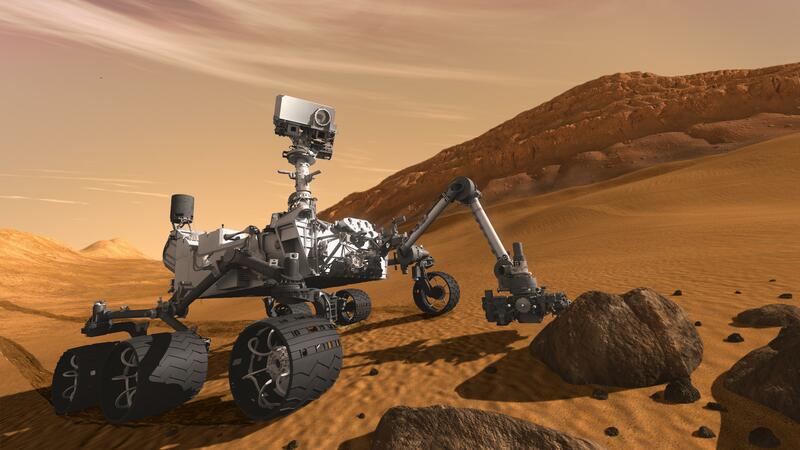 NASA's Curiosity rover is the largest rover ever to be sent to Mars. The spacecraft weighs a ton and is about the size of a Mini Cooper car. It is designed to study Mars in more detail than ever before using 10 different science instruments. The rover is so large that instead of using only thrusters for a controlled landing like the recent Mars Phoenix Lander, or giant airbags to cushion a bouncy touchdown like the rovers Spirit and Opportunity,Curiosity will land with something new — a rocket-powered sky crane. The sky crane system works like this: After Curiosity arrives at Mars in August 2012, the rover will enter the Martian atmosphere while still protected by its huge heat shield and back shell. Once the rover passes safely into the Mars atmosphere, a parachute will deploy to slow the spacecraft. Then the heat shield is jettisoned, followed by the actual rover, which pops free of its back shell and ignites a set of thrusters to slow its descent even further. When Curiosity is hovering about 60 feet above the Martian surface, it will be lowered from its sky crane shell on cables to land on the planet. The method should allow Curiosity to land with more accuracy than previous missions, NASA officials have said. But before Curiosity can hope to land, it needs a final destination to aim for. NASA will broadcast the Friday press briefing to announce the Mars rover's landing site live on NASA TV, as well as via a webcast.